WordPress is a powerful open-source content management system (CMS) and it is our choice of CMS for all of our non-e-commerce websites. We even recommend it an an option for our clients who need powerful e-commerce website too. WordPress powers almost 30% of all websites on the Internet today. It allows even the most novice person to easily add/edit/delete pages on their own website without the need for a developer such as Bluehive Interactive to act as the middle man. Imagine this – your website has been running for a period of time and you have been regularly publishing interesting content to attract and keep an audience, or maybe you’re making your livelihood through an eCommerce plugin such as WooCommerce, affiliate marketing, advertising, or any of the other multitude of ways to monetize your site. Then one day you visit your admin area and receive notifications that one or more of your plugins, themes, or even WordPress itself has available updates. Now what? What will you do if you update your site and everything stops working. Maybe you’re even presented with the dreaded white screen of death.. Scheduled Major/Minor Updates – Typically these updates are released every 9 – 12 weeks. Security Updates – Typically these updates are released between the scheduled major releases. These vary and only come out when a security issue is located within the software. These are deemed highly important by the WordPress core team, and as such are pushed out automatically. In addition to the major/minor and security updates to the core software, updates are also released for plugins which maybe installed on your website. A plugin is simply a small program which runs under the WordPress core software. These may include such things as slide shows, form processing (contact forms, sales forms), blog comment spam protection, etc.. Typically you can expect at least 1 plugin installed on your website to have an update each month. We recommend that you have Bluehive Interactive update your WordPress core software and plugins once per month. In addition to software updates there are other areas which can cause issues for your website if left unchecked. These include malware scans, removal of spam comments and excess post revisions, database optimization and performance checks, full site backups (both database and files), or restore your site from backup in an emergency. The leading cause for a website to experience issues is due to outdated software and/or weak passwords. To help with maintaining the software for your website, we offer a convenient monthly backup and update service so you never have to worry if your website software is up to date or not, and if your website is backed up and free of security issues. We are happy to migrate you for free during the setup process to a more suitable WordPress hosting environment provided by our approved partner Big Hippo. A living, breathing developer will update your core WordPress installation, plugins and themes. We will make sure you’re backed up before updating and offer full support you if there are any compatibility issues. Your site will be safe and secure using the world’s top WordPress malware monitoring and cleanup service, WordFence. Websites are constantly under the microscope of people scanning the web looking for vulnerabilities. We perform an initial site security audit scan to identify vulnerabilities. Your site will then be scanned daily for vulnerabilities. From time to time you may need the assistance of a developer to add a new page, make some changes to the header or footer of your website or possibly some troubleshooting to alter the look and feel of the website. We offer these changes outside of our monthly maintenance plans at our agency hourly rate of $75. We install some software to monitor your website for updates as they become available. Your website will be setup to automatically backup the database on a daily basis. We will also preform a full site backup (database, theme, plugins, WordPress core) as well. We will preform updates to the WordPress core, plugins, and theme if necessary. Also included is a pro license to the popular WordFence security plugin – a $99 value. This plugin has over 1 Million plus installations around the Internet. WordFence provides advanced notice when something just isn’t quite right on your WordPress website. Keeping your website up-to-date and using strong passwords is the first line of defense, but having WordFence in your back pocket will allow your website to be even more secure! WordFence provides notification of malware which could be inserted into your website without you knowing it is there. We take care of the monitoring and you do not have to lift a finger! We offer 2 different plans – Non-E-commerce and E-Commerce. The primary reason for the 2 different plans is because we’ve found that e-commerce websites required just a bit more to keep everything running smoothly. There tends to be more plugins installed and a higher frequency of data change in an e-commerce website. To make the process as convenient and hands off as possible for you, we will set everything up for you the first month to preform the backups and the updates. We simply ask for your billing information and automatically charge your credit card each month. There are no long term contracts. Can I use Windows hosting? Linux hosting is highly preferred but not strictly required. Windows hosting may limit some of the services we can provide. We accept Windows hosting accounts on a case-by-case basis. If we feel your hosting is not compatible with our service and you are unwilling to take part in our free migration to any of our hosting partners, we will cancel your account at no charge. We highly recommend using one of our WordPress hosting partners. Do you support multi-site WordPress installs? Due to the variable nature of multisite installations, WordPress Multsite is not included in our package. If you have a multisite installation, we can support you through a customized maintenance retainer that suits your needs, performed by our developers. Do you have a multisite installation? Shoot us an email today to find out more about what we can do for you. What do I need to provide in order to use your service? WordPress Admin, FTP, and SSH access. If you are unsure of how to provide us with those details we’ll be happy to help get the access we need. Do I have to change web hosting providers? No, you don’t – but we will most likely recommend our preferred hosting partner. Your website is an investment and you should pay for quality hosting. There are a variety of low, medium and high cost hosts available depending on your unique website needs. We’ll help you choose which is right for you and work with you to migrate your website. If your host does not support any of our recommended backup options or does not meet our minimum requirements for hosting, you may not be eligible to receive all benefits of our service. Are there requirements for my web hosting environment? For automated and/or offsite backups you should also have the ability to email, FTP or SFTP to/from the server. What happens if my site is compromised or flagged as malware? Please, first understand this happens to thousands of sites daily and will not destroy your online presence. We can quickly help you resolve these issues and clear your flags from search engines. In these instances, we will forward the required information to our security partner WordFence. Their team of experts will investigate, clean and/or restore your site and help you move forward. While this is rare when combining the monitoring of WordFence’s service with our preventative maintenance, there’s always a chance it could happen. Once resolved, we will notify you to re-submit to Google and/or other search engines for review, removing the malware notice(s). Yes – after your first two months you can cancel within 30-days of your renewal date. You’re never required to stay with us – in fact, we’d prefer you have the option to leave if you’re unhappy with our service and give us feedback on how we can serve you better. Can you re-design our website? What if we have a specific project/web design/development need? We offer full-service retainers through Bluehive Interactive, outside of our monthly website software, backup and malware maintenance plans. If you’d like to discuss making changes to the front-end (the part your visitors see) or a full website redesign, please fill out our form here and we’ll get in touch with you to learn more. 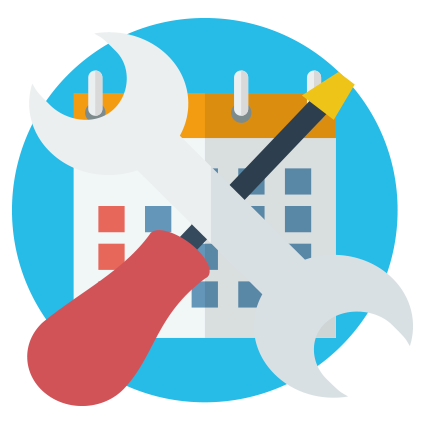 Ready to get started with a WordPress software maintenance plan with us? Simply drop us a line or give us a call at 412-275-6555. Looking for some change to the front of your website? Do you need a new page added or something to be customized? We’d be happy to provide you with an estimate for any work. Simply contact us to get more information.